By the 1890s Colonel Albert A Pope of Hartford Connecticut controlled the largest bicycle-building organisation in the United States, the cycles bearing the Columbia name. He also owned steel-tube and tyre factories. Not himself and engineer, Pope hired able individuals to interpret his ideas, one such being Hiram Percy Maxim, son of 'machine–gun' Maxim, who from 1898 developed a range of electric vehicles, 500 of which were built in the next two years. By 1903 there were 20 different models of Columbia electric vehicles on offer, and these were cumbersomely designated by Roman numerals. It takes a moment or two to work out, for instance, that the Mark XXXVIIII was simply one of the several runabouts available! 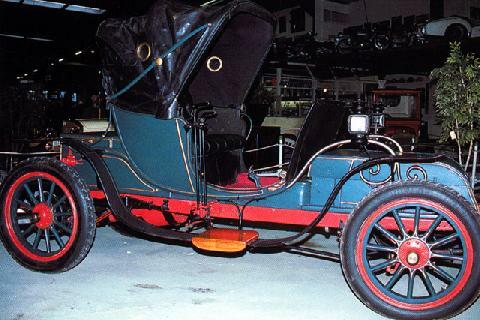 Petrol-engined cars were made from 1899, initially a single-cylinder model, whilst by 1904 a two-cylinder Mark XLIII and a four-cylinder Mark XLII could be bought. Colonel Pope was responsible for five makes that bore his name, but the Columbia business collapsed in 1913 following attempts to form a rival organisation to the General Motors Corporation.